THOMPSON – Coming to Thompson with the North East Street Stock Tour means coming home for Joe Arena. The Bristol driver is a former weekly racer at the track. Saturday he celebrated the perfect homecoming. 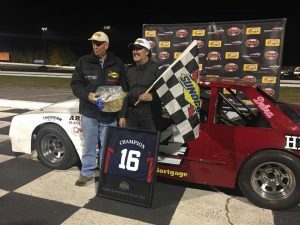 Arena scored victory in the 25-lap North East Street Stock Tour feature at the Sunoco World Series at Thompson Speedway. Arena also clinched his second consecutive series title with the victory. Kyle Casagrande of Stafford was second and Jim Silvia of Middletown, R.I. third. It was nice that they let the 2 trucks that showed up race with them. Why is it that the trucks never show up to Thompson anymore? Is it because it wasn’t the Mr. Rooter series?